Triple-doubles, flying elbows, two ejections and a revved-up crowd cheering until the end. Even Michael Jordan was there sitting courtside. It may only be December, but Friday night’s game between the Charlotte Hornets and Chicago Bulls had all of the intensity of a postseason game. Nic Batum had 20 points, 11 rebounds and 10 assists for his first triple-double of the season, and the Hornets beat the Bulls 103-91 for their third straight victory. Charlotte had to hold off the Bulls in the fourth quarter in a game that ended with Robin Lopez and Taj Gibson getting ejected. The normally mild-mannered Lopez could face a suspension from the league after he simultaneously elbowed Cody Zeller and Marvin Williams in the face – using both elbows – with 38 seconds left and the outcome already decided. Gibson, who had picked up a technical foul for arguing a call earlier in the fourth quarter, got his second and was ejected when he debated the call. After watching the replay, referees sent Lopez to the locker room with a flagrant 2 foul. Lopez wouldn’t say exactly what set him off. Kemba Walker chipped in with 20 points, and Michael Kidd-Gilchrist had 12 points, nine rebounds and four blocked shots for Charlotte (17-13). The Hornets had a crucial four-point swing go their way with 3 minutes left when Batum hustled down the floor to block the 7-foot Lopez’s layup off a fast break. Walker then converted a reverse layup on the other end. Despite the efforts of Jimmy Butler, who drained back-to-back jumpers, the Bulls could never quite claw back in it after that. Bulls: Dwyane Wade played despite battling a migraine headache most of the day and had 12 points on 5-of-16 shooting. … Chicago outrebounded the Hornets 52-48. 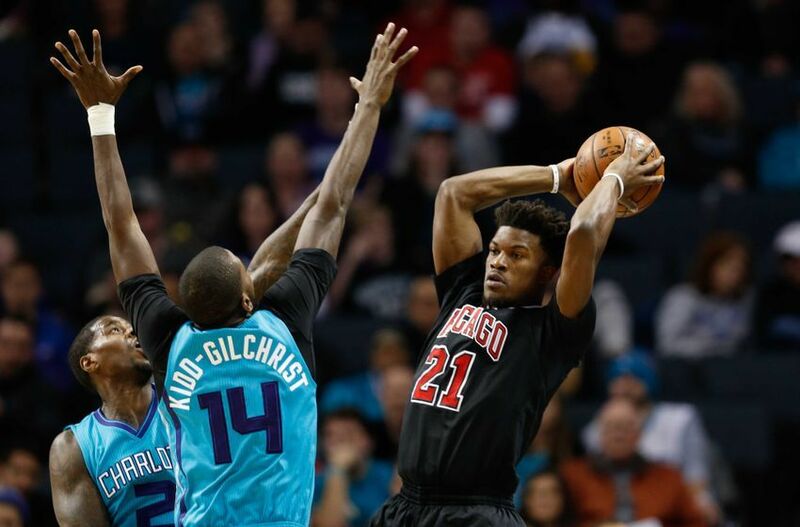 The Hornets held the Bulls to 39.6 percent shooting and blocked a season-high 13 shots. Jimmy Butler had 26 points for the Bulls (14-15), who have lost five of their last six to fall below .500 for the first time this season. Butler has scored at least 20 points in 24 of the team’s 29 games this season. The Hornets have a tough stretch coming up, including a home game against the Cleveland Cavaliers. ”Once we got back from our road trip we said we need to find a new intensity and I think we’ve done that these last few games and hopefully it keeps going,” said forward Frank Kaminsky. Bulls: Chicago will travel to San Antonio for a Christmas day matinee game against the San Antonio Spurs. Hornets: Head to Brooklyn on Monday to face the Nets. Charlotte has lost four of its last five games on the road.